In a post-digital media landscape tracked endlessly by streams and feeds of images, it is clearer than ever that photography is an art poised between arresting singularity and ambiguous plurality. Drawing on work in visual culture studies that emphasizes the interplay between still and moving images, In and Out of Sight: Modernist Writing and the Photographic Unseen provides a provocative new account of the relationship between photography and modernist literature — a literature that has long been considered to trace, in its formal experimentation, the influence of modern visual technologies. Making pioneering claims about the importance of photography to the writing of Gertrude Stein, Jean Toomer, John Dos Passos, and F. Scott Fitzgerald, Alix Beeston traverses the history of photography in the late nineteenth and early twentieth centuries. From the composite experiments of Francis Galton to the epic portrait project of August Sander; from the surrealist self-fashioning of Claude Cahun to the reappropriation of lynching photographs by black activist groups; from the collectable postcards of Broadway stars to the glamour shots of Hollywood celebrities: these and other serialized photographic projects provide essential contexts for understanding the fragmentary, composite forms of literary modernism. 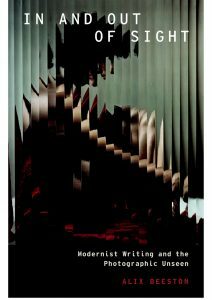 In a series of richly detailed literary analyses, Beeston argues that the gaps and intervals of the composite literary text model the visual syntax of photography — as well as its silences, absences, and equivocations. In them, the social and political order of modernity is negotiated and reshaped. Moving in and out of these textual openings, In and Out of Sight pursues the fleeting, visible and invisible figure of the woman-in-series, who recasts absence and silence as forms of presence and witness. This shadowy figure emerges as central to the conceptual space of modernist literature — a terrain not only gendered but radically constructed around the instability of female bodies and their desires.